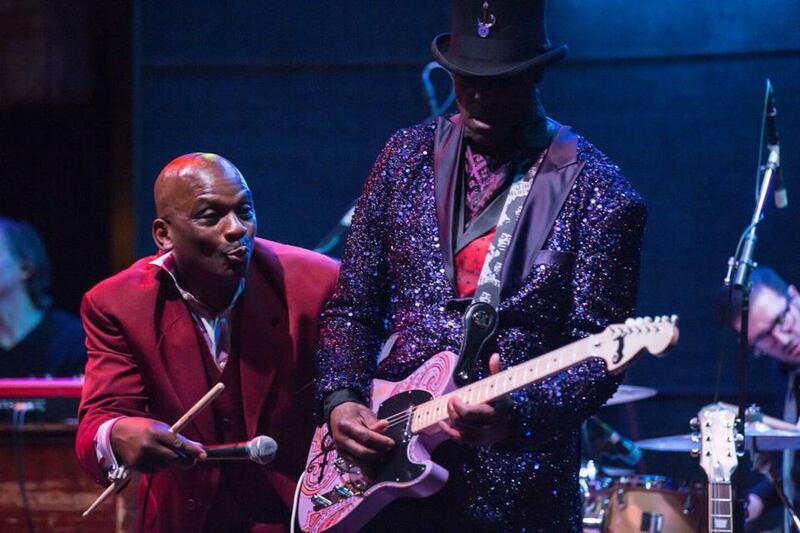 Jerome Benton (left) and Jellybean Johnson of fDeluxe, formerly the Family, performing Wednesday in Minneapolis. After spending two days in a megamall, we finally know how Tom Hanks’s character felt being trapped in “The Terminal.” Wandering around the Mall of America would be comical if it weren’t so soul-crushing. But our existential dread was easily vanquished with a visit to Paisley Park, the compound in nearby Chanhassen where the cultural phenomenon known as Prince lived and worked and, judging from all the candles and comfy couches, really enjoyed himself. Don’t bother bringing your cellphone or camera because they’re “secured” by Paisley Park staff as soon as you walk in, placed in a locked pouch. And you’re not allowed to just meander willy-nilly around the 65,000-square-foot complex, which resembles a storage facility to cars racing by on Highway 5. Prince was a fiercely private person, and his residence, which we imagine is something to behold, is off limits. Still, there’s plenty to contemplate at Paisley Park, including loads of familiar items from Prince’s closet — the cream-colored outfits, the iconic “Purple Rain” ensemble etc. — as well as an array of his distinctive “cloud” guitars, notebooks with scribbled lyrics, and the urn containing his ashes. 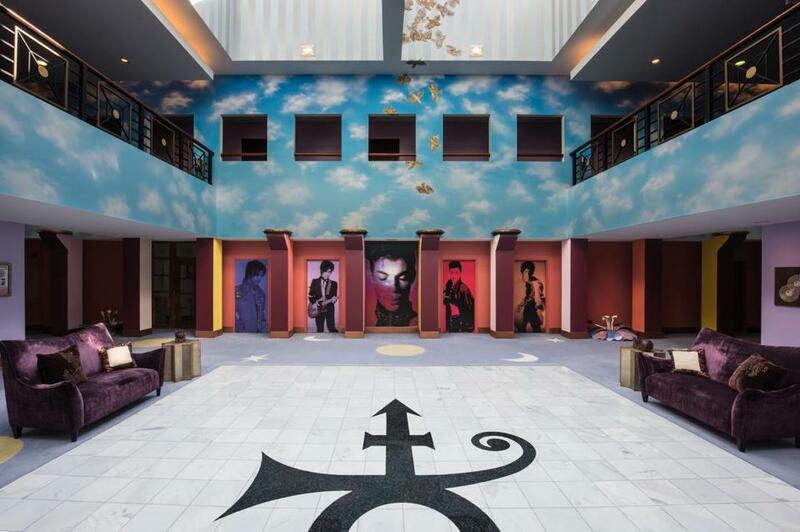 The atrium at Paisley Park is the first thing visitors see. What? Yes, the urn containing Prince’s ashes is stored in an opaque plexiglass box affixed to a wall in the atrium, which is the first space you visit on the tour. Our guide suggested we take a quiet moment to reflect, offering tissues to anyone who needed one. We were speechless and a tiny bit spooked. Studio B is smaller and less formal. It has two pianos and a ping pong table — Prince could really play — and resting on one of the pianos is a white camel-hair bucket hat. “That’s where Prince left it, so that’s where it’s staying,” our guide explained. The tour winds up in the NPG Music Club, Prince’s private nightclub where he’d play impromptu late-night shows. (He’d tease them on Twitter and if fans got there in time, they were in.) The space resembles an ordinary nightclub, except the stage is crowded with plants and ringed with couches and pillows. Our guide told us about the time Madonna came around after her show in Minneapolis. It was well after midnight and the Material Girl sat on the edge of the stage while Prince serenaded her. There’s no bar at the NPG Music Club because Prince prohibited drinking and smoking at Paisley Park. We didn’t get to see the massive sound stage where Prince and his band used to rehearse before touring because workers were getting it ready for Justin Timberlake’s listening party Thursday night. It was six degrees when we left Paisley Park, and we felt sad gazing at the windowless facade bathed in purple light as we pulled out of the parking lot. Our next stop was the Dakota Jazz Club in downtown Minneapolis, where the Family, a band formed by Prince in the 1980s, was playing a rare show. The reunited band, calling themselves fDeluxe now, includes hype man Jerome Benton, who had parts in Prince’s three movies, singer Paul Peterson, formerly of the Time, Prince’s onetime fiancee Susannah Melvoin, guitarist/drummer Jellybean Johnson, and horn player Eric Leeds. Showing no ill effects from either age or inaction, the band was excellent and closed the show with their rendition of “Nothing Compares 2 U,” which Prince wrote and The Family recorded — and released — several years before it was a hit for Sinéad O’Connor. The band was joined on stage at the end by Melvoin’s twin sister, Wendy Melvoin, who, as any self-respecting Prince fan knows, was a guitarist and one of his backup singers, along with Lisa Coleman. As the crowd roared its approval, Prince felt very much alive.